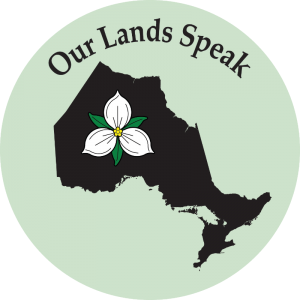 Our Lands Speak: Queensville Doan Site, Part 1 | Bill Finlayson, Ph.D. 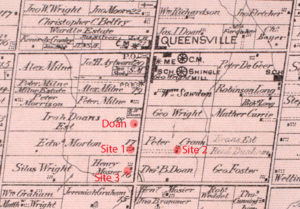 This is the fourth blog summarizing our excavations at the five rural farmsteads in Queensville, a 19th Century Crossroads Community in the Township of East Gwillimbury, Ontario. 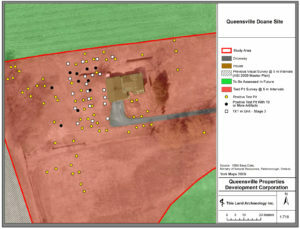 We found the Queensville Doan site while digging test pits behind the recently vacated house on Lot 17, Concession 2. 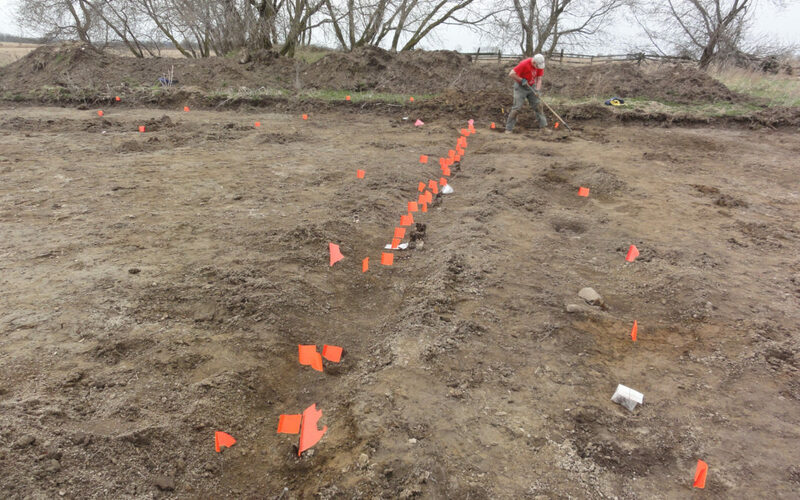 Our 73 test pits produced 345 artifacts indicating that early occupation occurred prior to 1850. Do you ever wonder what it would’ve been like to live and work back then? Or what it would’ve been like for your ancestors? The most important result of our archival research was the discovery that Ebenzer Doan, one of the master builders of the Sharon temple, had purchased the lot in 1832 and share-cropped the farm with his son, Ira. Our Stage 3 test excavations involved digging 20 1×1-metre squares which produced 1,369 artifacts. This confirmed that Stage 4 excavations were required. These began in the fall of 2010 and were completed in 2011. A gradall was used to remove topsoil from 3,778 square metres of the site. Our digs revealed that the site extended under a modern addition to the 19th century farmhouse and that more than one metre of fill had been added to the original ground surface to allow this addition to be level with the original house. This suggested that a part of the archaeological site was located under this addition. Accordingly, we got permission to demolish the addition and, after the removal of the modern fill, found archaeological features further relating to the occupation of the site. 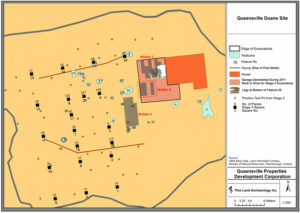 Our excavations exposed the presence of three middens (A-C) in the attached site map. They produced 10,391 artifacts, about 28% of all artifacts recovered from our Stage 4 work. Another very interesting and fascinating feature; two rows of post moulds which defined what we believe to be a corral behind the house. These post moulds were circular dark stains in the subsoil where there had been a post in the ground. Either the post rotted or it was pulled out and dark topsoil filled the hole where the post had been. Such corrals are relatively rare. We did find a similar structure at the Ekhardt Log House site in Markham. Also of interest was the investigation of seven privies located behind the house. One of these contain an amazing quantity of broken ceramics, many of which could be partially reconstructed. This will be the subject of my next blog. In the meantime, if you’re new to my blog and Our Lands Speak—a comprehensive series of books which detail our investigation of Ontario’s rich archaeological past—and would like to learn more, check out Volume 2 here, The Archaeology of Five Queensville Farmsteads. We’re excited to share that Volume 3 is already in motion for 2019. More on that later. I’ll be in touch again soon with a slight segue on the value of learning and gathering knowledge, the process and the gold. Then in the new year we’ll wrap up our mini-series on Queensville. Thanks as always for following along and engaging in conversation here and on social media.